A famous member of the B complex, vitamin B5 (or pantothenic acid) is the best ally against stress. Vitamin B5 supports the activity of the adrenal glands and is essential for proteins, fats and carbohydrates metabolism. In addition to this, vitamin B5 maintains a normal sodium-potassium ratio which, in turn, engages truly wonderful health benefits. A balanced and varied diet should provide generous amounts of vitamin B5, necessary for a healthy body and mind. Why is vitamin B5 so important and what are its health benefits? First of all, you should know that vitamin B5 (or pantothenic acid) is present in all living creatures, hence its other name: pantothenic (derived from the Greek term pantos, or everywhere). It can be found in bacteria, molds, plants, animals and people. Interesting fact: did you know that our intestinal flora (the bacteria in our stomach) produces vitamin B5? This, along with a healthy diet, significantly reduces the risk of vitamin B5 deficiency, a condition characterized mostly by fatigue and tingling and numbness in arms and legs. But it also means that not having a sufficient intake of B5 or suffering from various conditions of the digestive system that inadvertently cause poor absorption of vitamins and minerals can lead to serious nutritional deficiencies, vitamin B5 included. Also, increased nutritional requirements as a result of stress, disease, increased physical activity, pregnancy, nursing or growth spurts can mean that you risk a vitamin B5 deficiency even though you are getting your recommended daily intake. Up until 2016, the recommended daily intake of vitamin B5 was 10 mg a day for an average adult on a 2000 kcal diet. Starting with 2016, daily values have been reduced to 5 mg of vitamin B5 a day. The new recommended daily values of essential nutrients are to be adopted from 2017 to 2021. A more severe deficit of pantothenic acid can can render everyday life exhausting through headaches, nausea, fatigue, disturbed sleep, apathy and utter lack of energy and even contribute to a variety of health problems in the long run. Fortunately, a deficiency is rare because there are plenty of dietary sources of the vitamin that help us meet our daily requirements. Dietary sources: Mushrooms, avocado, plain yogurt, cabbage, broccoli, sunflower seeds, poultry and beef liver, egg yolk are some of the best sources of vitamin B5. 1) Vitamin B5 maintains a normal sodium-potassium ratio. To be more exact, generous amounts of vitamin B5 keep sodium levels low and potassium levels high. Sodium is a mineral that causes water retention and high blood pressure; potassium is a mineral which regulates body fluids and blood pressure by neutralizing sodium effects. 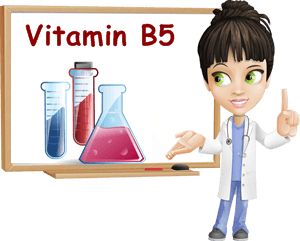 Vitamin B5 helps maintain a balance between the two so that, in the end, we can enjoy all the health benefits of potassium, without being exposed to the health hazards brought on by sodium. 2) Vitamin B5 supports the function of the adrenal glands. The suprarenal or adrenal glands are hormone producing glands situated just above the kidneys. Adrenal glands are responsible for stress-related hormone production. Vitamin B5 supports the activity of the adrenal glands, encouraging the production of sufficient amounts of hormones meant to help us cope with stress. Vitamin B5 deficiency can lead to adrenal insufficiency. 3) Vitamin B5 helps with depression. Some studies suggest that the human brain makes use of great amounts of vitamin B5 in order to function properly. It is believed that vitamin B5 deficiency can lead to apathy, muscle weakness, digestive symptoms and even depression. 4) Vitamin B5 has potent antioxidant effects. (Vitamin B5) Pantothenic acid helps synthesize Coenzyme A, an antioxidant which plays a crucial part in the synthesis of fatty acids. 5) Vitamin B5 is used for the treatment of several nerve disorders and various medical conditions such as: multiple sclerosis, Parkinson’s disease, peripheral neuritis, prostatitis (or prostate gland inflammation), premenstrual syndrome, rheumatoid arthritis, mouth ulcers, chronic fatigue syndrome and growth retardation. An adequate intake of B vitamins, pantothenic acid included, is essential for an overall good health. Vitamins (and minerals) build up our health and strengthen our immune system. As you can see from this brief overview, vitamin B5 brings us truly wonderful health benefits. Not only does it support brain function, adrenal glands activity and proteins, fats and carbohydrates metabolism, but it also eases a variety of debilitating medical conditions such as multiple sclerosis, rheumatoid arthritis and chronic fatigue syndrome.